Also returning is Detective Bryant, who helps Annie and Beatrice — I mean, whom Annie and Beatrice help — solve several murders in the Cumberland Creek area. A new character in the series is Cookie Crandall. Cookie is a new member of the Scrapbook Crop, a yoga instructor, a vegetarian, and a witch. At the weekly Crops, Cookie works on her "Scrapbook of Shadows," as she calls it. You may be wondering, since shadows are without form and substance (except for Peter Pan's, and he isn't in this book), how can shadows be made into a scrapbook? Oooh, a teaser! You'll have to read the book to find out! Originally, this book was to have been titled Scrapbook of Shadows. I asked Author Mollie Cox Bryan why the title was changed. MCB: The deal with SCRAPPED is both my editor and I loved the title SCRAPBOOK OF SHADOWS, so we used it in the back of SECRETS, as you no doubt read. But when the book went through sales and marketing, they did not like it. I'll never understand it. I like the original title better, as well. But I like this title, too and the book has done okay with this title--so they might have been onto something. I think there might be a lot of other books out there with similar titles to SCRAPBOOK OF SHADOWS, which could have created some confusion. Thanks for dropping by Jane Reads to answer that question, Mollie. Inquiring minds wanted to know. Here are two more teasers, just to pique your interest in this great read. from a river was not what Annie had planned for the day. Whose body? What was the cause of death? (Probably murder, since this is a murder mystery.) Whodunnit? of you. But I don't want to see you dead." Who is speaking? Who is he/she speaking to? I really enjoyed reading Scrapped! 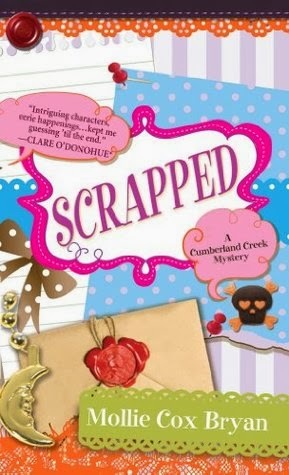 I recommend it to fellow cozy mystery readers; cozy fans who scrapbook will especially enjoy Scrapped. Book 3 of the Cumberland Creek Mystery series, Death of an Irish Diva, will be published in February 2014. The Blog Tour begins on February 4. I am pleased to announce that Jane Reads will be on the tour on February 11. I hope to see you then!